Mild foam cleanser for sensitive skin. In the morning: Gently massage wet face with cleanser and wash off with lukewarm water. In the night: After 1st cleansing, massage face with cleanser and wash off with lukewarm water. Banila co. Multi-functional cleanser which can work as lip and eye remover, cleansing oil and foam cleanser. Take an appropriate amount and gently spread on the face and massage. Wash with lukewarm water. PURITO pH Cleanser pH test 퓨리토 약산성 클린저 테스트 - YouTube. Video will open in a new window[isdntekvideo]. Paste link into a browser window:[isdntekvideo]. [MISSHA] Near Skin PH Balancing Cleansing Oil 150ml. Mild cleansing that protects the skin with a mild acidic base and makes it healthy. It is a highly hydrophilic cleansing oil that cleanse waste and make-up residue at once without emulsifying. Matcha and hemp seeds are here to boost the skin’s intake of antioxidants and essential fatty acids. Your skin and this cleanser might be a matcha made in heaven! KOSE Softymo. Deep Cleansing Oil. Dry Hand use. Sulwhasoo Gentle Cleansing Oil EX 100ml (50ml x 2pcs) 2gift. Sulwhasoo Gentle Cleansing Oil EX 100ml (50ml x 2pcs). Keratotic Plug Removal. KOSE Softymo. Speedy Cleansing Oil. Wet Hand OK.
PURITO Snail All In One BB Cleanser 250ml. sleek without feeling tight even after washing. It is customized for BB Cream users allows deep. cleansing of the skin, removing any dead skin cells and makeup residues without skin irritation. Rohto Hadalabo 極潤 Gokujyun. Rohto Hadalabo (Hada Labo) Gokujyun. Use them as a system to cleanse, hydrate, and treat your skin for healthy looking, more youthful, and beautifully radiant results. Oil Cleansing 200mL. KOSE Softymo. Speedy Cleansing Oil Refill. Wet Hand OK.
4-Free (Mineral oil, artificial colors, animal ingredients and ethanol free). Pour a moderate amount to hands and apply all over face evenly. (Do not put water on your hands and face.). Product info. Add water and lather. Massage onto face and neck, avoiding eye area. Rinse with warm water. leaving skin soft and smooth without the stripping feeling. Product Info. It gently removes impurities and excess sebum while fighting pimples and blemishes. KOSE Softymo. Deep Cleansing Oil. Refill 200mL. Dry Hand Use. After massage with little bit of water on fingertip, wash out thoroughly with lukewarm water. All Skin Type. It removes skin impurities or makeup clearly and resolves well with water so that it can be washed off easily. 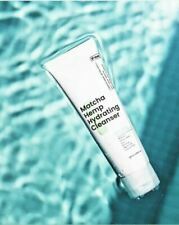 [MISSHA] Super Aqua Refreshing Cleansing Foam 200ml. Facial Cleanser 120g. Perfect Whip. Is typical of rose flowers, specific for Bulgarian Rosa Damascena. It is a great cleanser and aids in removing oil and dirt accumulated in clogged pores", says Dr. Deepali Bhardwaj, Skincare Expert. Wet hands and face thoroughly with lukewarm water. Put an appropriate amount on the wet hand to create a rich bubble. WHAT IT IS. White clay (aolin) effectively removes bodily wastes and excessive sebum. Wonder pore ultra solution for overall concerns about pores. Mint buble deep cleanses bodily wastes stuck in the pores. How to use. Rohto Hadalabo 極潤 Gokujyun. Rohto Hadalabo (Hada Labo) Gokujyun. Use them as a system to cleanse, hydrate, and treat your skin for healthy looking, more youthful, and beautifully radiant results. Rohto Hadalabo 極潤 Gokujyun. Rohto Hadalabo (Hada Labo) Gokujyun. Use them as a system to cleanse, hydrate, and treat your skin for healthy looking, more youthful, and beautifully radiant results. Oil Cleansing Refill 180mL. Creamy Wash 130g. for Acne Care. Vitamin C,E. 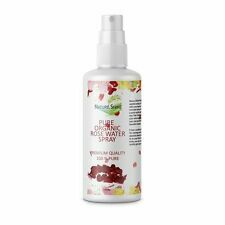 Beauty Water (60ml) Travel Size. Capacity : 60ml. Son & Park . Apple Seed Cleansing Oil. - Cleansing oil containing apple seed oil removes thick makeup and waste from pores. - This cleansing oil removes thick makeup and dirt from the skin with a gentle rolling sensation and cleans the skin without flicking. Rohto Hadalabo 極潤 Gokujyun. Rohto Hadalabo (Hada Labo) Gokujyun. by Int'l Potal. [MISSHA] Near Skin pH Balancing Cleansing Foam 150ml. AHA & BHA 75g. Mix Fruits Fragrance. Powder Wash. Hold the stick and gently roll to massage the face without water to dissolve the makeup. All-in-one cleansing facial cleanser from makeup to blackhead. Easily dissolved in the oil overnight, more convenient as a stick type to clean the skin and skin stress! 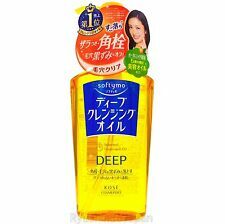 [TONYMOLY] Wonder Apricot Seed Deep Cleansing Oil 190ml. This fun and functional sheet mask collection features different ingredients all targeting different skin concerns. Apply mask on clean and towel-dried face. [SEANTREE] Horse Oil 100 Cleansing Foam 120ml. Take suitable amount and make sufficient bubbles when washup, massage on face and. Horse oil contained cleansing foam for a radiant and healthy skin. Creamy and rich foam that makes you feel nutrition of horse oil cleanses off your skin wates and. White Clay effectively removes sebums and skin wastes inside pores. All Skin Type. Peppermint beads cares dead skin cells. Product info. Massage your face with bubbles and wash off with lukewarm water. Fine, delicate and dense lather removes impurities & remainings of makeup hidden in the pores throughly. We produly and gladly present this special promotion. Made in Korea. All Skin Type. Product Info. Tonymoly - New Egg Pore Blackhead Steam Balm 30g. Powerful black-heads removing steam Bomb balm. 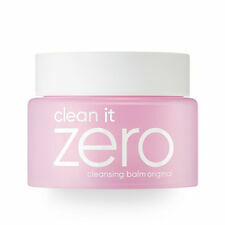 After transparent balm turns into white, wash it off with luke warm water. Without steam towel, Its heat open up pores. Massage gently appropriate amount and wash off or sweep off with tissues. Soft sherbet-like formula provides a quick & easy all-in-one one-step cleansing without irritating. It is customized for BB Cream users allows deep cleansing of the skin, removing any dead skin cells and makeup residues without skin irritation. Add an appropriate amount of water to your face and rub to generate bubbles to remove skin waste. Apply an appropriate amount of oil on your hand. Massage your face with your hands for 30 second ~ 1 minute. The mild bubble cleanser reduces skin friction and cleanses mildly without stress. The low pH similar to the pH of the skin cares the skin healthily. All Skin Type. Product info.